Friday, February 28, 2014, at 12 noon Eastern. Topic: Learn the basics of WordPress. What is thing called WordPress? How to I start my blog or website using WordPress? Basics of core software, themes, plugins. We will answer the immortal question of What Would Justin Bieber Do (#WWJBD)? Answer: He would (and does) have a WordPress website. Domain host – must permit WordPress installations. Virtually all do. Software gets updated. Update your software! Design your site so it is easy to navigate. Photo credit: Screenshot from WordPress.org. 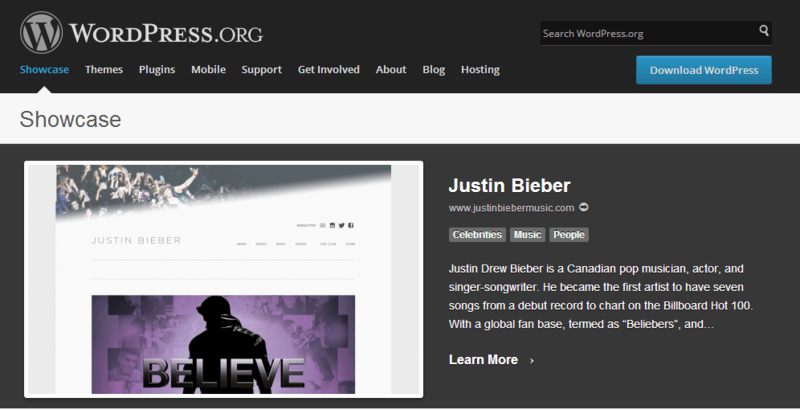 Use does not connote endorsement by WordPress or Justin Bieber.